1996-02-01. Good. Ships with Tracking Number! INTERNATIONAL WORLDWIDE Shipping available. May not contain Access Codes or Supplements. May be ex-library. Shipping & Handling by region. Buy with confidence, excellent customer service! New York: Signet Books - New American Library, 1996. (xii) 400 pp. Light edge and corner wear with some minor creasing on the spine; no interior markings. This anthology contains: Over Again by Joyce Carol Oates; The Snail Watcher by Patricia Highsmith; Dealer's Choice by Sara Paretsky; Pig Latin by Clarice Lispector; Fathers and Daughters by Laura Grimaldi; The Moment Before the Gun Went Off by Nadine Gordimer; The Werewolf by Angela Carter; The Parker Shotgun by Sue Grafton; The Watts Lions by Walter Mosley; Just Say No by Roger L. Simon; In the Bronx by Don Delillo; Goldfish by Didier Daeninckx; Cathedral by Raymond Carver; The Summer of '37 by Julian Semionov; No Radio by Mickey Friedman; Mafia Western by Leonardo Sciascia; Manufacture of a Legend by Paco Ignacio Taibo ll; The King by Isaac Babel; The Lae of the Eye by Pieke Biermann; The Merciful Angel of Death by Lawrence Block; Ishmael by Joe Gores; The Last Voyage of the Ghost Ship by Gabriel Garcia Marquez; Cain by Andrew Vachss; The Ultimate Caper by Donald E. Westlake; Chee's Witch by Tony Hillerman; Cities and the Dead by Italo Calvino; Gravy Train by James Ellroy; Death and the Compass by Jorge Luis Borges; Nicholas in Exile by Herbert Gold; Captain Blood by Donald Barthelme; Mirror Girl by William Bayer; The Man Who Hated Books by Stuart M. Kaminsky; Devices and Desires by P. D. James; Martyrdom by Yukio Mishima; Missionary Stew by Ross Thomas; Soft Monkey by Harlan Ellison; The Casebook of Dr. Billingsgate by Eric Wright; Imagine This by George C. Chesbro; A Boy and His Dog by Manuel Vasquez Montalban; A Good Man Is Hard to Find by Flannery O'Connor; I Spy by Graham Greene; and Little Leo by Jerome Charyn.. First Paperback Printing. Paperback. Very Good. NY: Signet Books. F. 1996. First Signet Edition. Paperback. 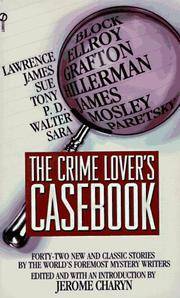 Fine copy featuring stories by Lawrence Block, Sue Grafton, James Ellr oy and others. .
Signet. Used - Very Good. Very Good condition. Signet. Used - Good. Ships from the UK. Former Library book. Shows some signs of wear, and may have some markings on the inside. 100% Money Back Guarantee. Your purchase also supports literacy charities. New York, New York USA: A Signet Book, 1996 Book. Very Good. Mass Market Paperback. Previous owner name on inside cover page..
Signet, 1996-02-01. Mass Market Paperback. Good. A nice copy with a tight and square binding. Softcovers are good. Text is clean but has lightly yellowed. Careful packaging and fast shipping. We recommend EXPEDITED MAIL for even faster delivery.